A soft tissue swelling located at the volar site of the forearm is regularly seen in orthopaedic practice. The differential diagnosis includes an accessory muscle or different vascular disorders. In this case report we describe a 20-year-old patient who presented at the orthopaedic outpatient department with a soft tissue mass of the forearm since seven years. Informed consent has been obtained. A 20-year-old otherwise healthy female patient (right dominant) presented at the outpatient orthopaedic department because of pain located proximal to the right wrist and a swelling since seven years. The patient visited the patient clinic at that moment due to increasing discomfort; there was no increase of the mass. At physical examination a swelling at the ulnar side of the palmaris tendon was observed, pivoting with the flexor tendon of the third finger. Sensory and motor examinations were normal. MR imaging of the forearm revealed an intramuscular haemangioma at the ventral side of the forearm around the flexor digitorum tendon of the third finger with a length of 10 cm and a maximum width of 2.2 cm. To get more information about the haemangioma additionally MR angiography was performed. This showed a slow-flow venous malformation (Figure. 1 and 2) and the patient was referred to the department of vascular surgery. 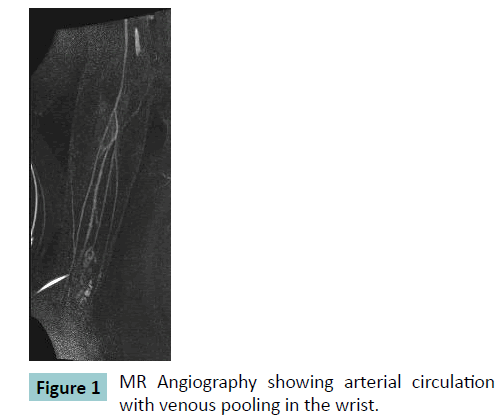 Figure 1: MR Angiography showing arterial circulation with venous pooling in the wrist. Figure 2: Slow-flow venous malformation located at the ventral side of the forearm. Because the patient had discomfort in combination with pain the therapy was initiated. This consisted of embolization of the venous malformation with 7 cc foam of the sclerosant aethoxysclerol 3% (30 mg/mL) (10 cc foam = 8 cc plain air and 2 mL aethoxysclerol). Six weeks later, the complaints had improved; however, the patient still experienced some pain. Therefore, a second embolization with 4 cc aethoxysclerol was performed. After another six weeks, there were still some convolutes seen with ultrasound, therefore a third embolization with 5 cc aethoxysclerol was performed. 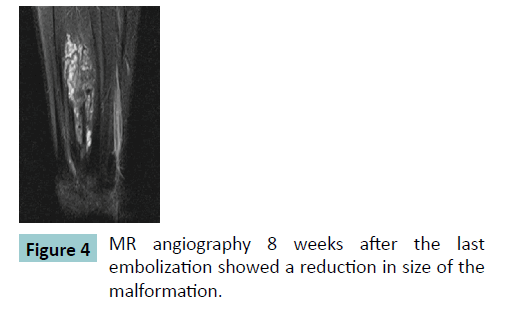 A control MR angiography 8 weeks after the last embolization showed an evident reduction in size of the malformation (Figure. 3 and 4). Patient had no complaints any more. Figure 3: MR angiography 8 weeks after the last embolization showed less venous pooling. Figure 4: MR angiography 8 weeks after the last embolization showed a reduction in size of the malformation. Patients, who present at the orthopaedic department with a flexible mass in the forearm, are often considered to have an aberrant muscle or other muscle pathology. However, as in this case, a venous malformation can also exist. Venous malformations are slow-flow vascular anomalies . They are frequently present at birth and grow proportionally with the patient; they will never regress [1,2]. Venous malformations result from an arrested development of the venous system during embryogenesis . In 93% they are sporadic and unifocal, but they can also occur in syndromes such as Klippel-Trenaunay and Maffucci syndrome . Venous malformations can affect any tissue or organ, they can be diffuse or well localized [1,4]. Intramuscular venous malformations have a different clinical presentation compared to nonmuscular malformations . There is often no skin colouring . Depending on size and location, they can cause pain (which can be aggravated by hormonal changes), muscle weakness and hypo- or hypertrophy [1,6]. Patients can also present with complaints of nerve compression [4,7]. There is often a soft and compressible mass palpable [4,8]. Intramuscular venous malformations are more often present in woman (2:1) and can be hormonally modulated [2,4]. In a series of 176 patients, most intramuscular venous malformations occurred in the head and neck region (47%). In 13% the malformation was located in the flexor digitorum in de forearm . The differential diagnosis of intramuscular venous malformations includes other vascular malformations (capillary, lymphatic, arterial, or combined lesions), haemangioma, angiosarcoma and an accessory muscle [2,6]. Venous malformations can be associated with spontaneous thrombosis and thrombolysis . Therefore, in patients with extensive malformations, evaluation of prothrombin time, international normalized ratio, D-dimer and fibrinogen level should be performed . D-dimer can be used as biomarker, since a venous malformation can permanently highly increase D-dimer levels in otherwise healthy patients. It has a specificity of 96.5%, but a sensitivity of only 42% . Plain radiographs typically demonstrate soft-tissue swelling, and pathognomonic phlebitis (caused by calcified persistent thrombi) . Doppler ultrasonography distinguishes slow-flow from fast-flow lesions. On MR imaging, lesions are isointense to surrounding muscle on T1-weighted sequences and hyper intense on T2-weighted sequences [5,9]. MR imaging combined with MR angiography is the most effective technique to evaluate the character and extent of the lesion, the flow and the state of conducting vessels [5,8]. Venous malformations can become more symptomatic over time. Treatment is advised if there is recurrent swelling, pain, deformity, interference with physical activity, thromboembolic complication or sepsis . Curative treatment is rarely possible. Compressive garments can reduce pain and risk of thrombosis. To diminish the volume of the malformation, percutaneous sclerotherapy is performed. The sclerosant damages the endothelial cells, causing thrombosis and subsequent fibrosis. As much as possible sclerosant is injected without overflow to the healthy vasculature. Sometimes some recanalization occurs; therefore repeated injections could be necessary after a period of six weeks. Complications of sclerotherapy include cutaneous necrosis, haemoglobinuria caused by hemolysis, peripheral nerve injury, venothromboembolism, and delayed muscle fibrosis and contractures [2,8]. Sclerotherapy is not indicated in case of multiple intralesional thromboses, neurologic impairment, or a related compression syndrome . Surgical resection can also be performed. It should be reserved for those malformations who cannot be treated by sclerotherapy. Eventually the entire muscle should be resected [1,2]. Complication rates up to 22% have been described, including seroma or hematoma formation requiring drainage, partial skin flap loss, cellulitis, hypertrophic scarring, neuroma, and amputation . In fertile woman with a painful swelling located at the wrist or forearm, the diagnosis of a venous malformation should be included in de differential diagnosis. The normal work-up is an ultrasound and if this is suspect for a venous malformation, a MR angiography should be made. However, in this case MR imaging preceded the MR angiography, therefore no ultrasound has been done any more. Dompmartin A, Vikkula M, Boon LM (2010) Venous malformation: update on aetiopathogenesis, diagnosis and management. Phlebology 25: 224-235. Hein KD, Mulliken JB, Kozakewich HPW, Upton J, Burrows PE (2002) Venous malformations of skeletal muscle. Plast Reconstr Surg./110:/1625-1635. Lee BB, Bergan J, Gloviczki P, Laredo J, Loose DA, Mattassi R eta al. (2009) International Union of Phloebology (IUP): Diagnosis and treatment of venous malformations – consensus document of the International Union of Phlebology. Int Angiol28: 434–451. Upton J, Coombs CJ, Mulliken JB, Burrows PE, Pap S (1999) Vascular Malformations of the Upper Limb: A Review of 270 Patients. J Hand Surg. 24: 1019–1035. Kim EY, Ahn JM, Yoon HK, Suh YL, Do YS, et al. (1999) Intramuscular vascular malformations of an extremity: findings on MR imaging and pathologic correlation. Skeletal Radiol. 28: 515–521. Casanova D, Boon LM, Vikkulac M (2006) Venous malformations: clinical characteristics and differential diagnosis. Annales de chirurgie plastique esthétique 51: 373–387. Marquardt G, Barduzal Angles SM, Leheta FD, Seifert V (2001) Median nerve compression caused by a venous aneurysm. Case report. J Neurosurg94: 624–626. Burrows PE (2013) Endovascular treatment of slow-flow vascular malformations. Tech Vasc Interventional Rad. 16: 12-21. Muchemwa FC, Ishihara T, Matsushita S (2007): Intramuscular venous malformation in the upper arm with gross calcifications and compression of the ulnar nerve. Scand J Plast Reconstr Surg Hand Surg41: 93-95.